Price crash 79990au, all offers considered. You cannot buy an 11 metre trimaran in such fabulous condition. Ready to sail, ready to race or cruise. Hasta la Vista is a multihull sailing Trimaran with cruising comforts. LOA is 11 metres, and a stable 9.15 metre beam. Hasta la Vista has been extensively modified by it's current owners, and now has pedigree. The boat is more stable, faster and more manageable than when she was purchased in 2014. An excellent passage boat whether it be for cruising or the keen racer. If you are a keen racer, this boat rates very well with the OMR handicap system. 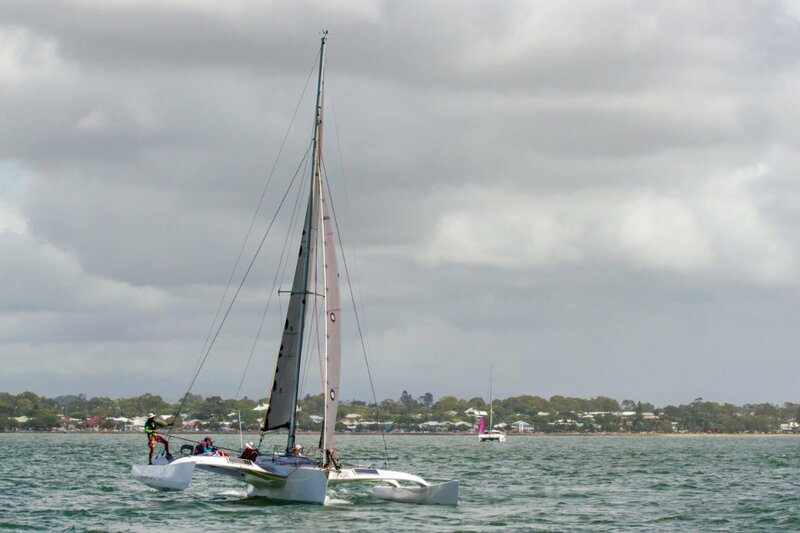 This boat has performed well in the last two Brisbane to Gladstone Multihull Yachts races. With this event coming up at Easter and at this price, the time to buy is NOW!Above deck features include canopies over the forward hatch and starboard or port net when at anchor, large Anderson 52 winches on both outer boards and two Lewmar 40 winches. All sails are in excellent condition. The sail wardrobe includes mainsail, three headsails, a screecher that is able to be carried upwind in up to 12 knots true wind, three spinnakers and a storm sail. Below decks are a large galley and pilot berth. The galley consists of plenty of cupboard space, a fridge/freezer, twin sinks, griller and two burner gas stove with independent shutoff valves. Forward of the centreboard case are a single berth port side and double, come two singles starboard side. Electric toilet with macerator and holding tank is beyond the sleeping quarters. Electronics consist of two 60 watt solar panels managed by a seatech system with three AGM batteries, two 110 amp hours and one 105 amp hour. The plotter is B&G giving accurate navigation data lined in with Raymarine instrumentation. The mast a spars have had a full refurbishment in 2015. Auxiliary power is a Honda 20 Hp outboard engine aligned to the electronic system. Ground tackle consists of a S/S stem at the bow, 2 x anchors of minimum 27 plough anchor. Tackle is 10 metre of chain and 30 metre of rope. Bridle as well.. A turning bollard assists with the overall system. Safety equipment is fully compliant with Category 3 racing and Marine Safety Queensland.